Why I read this book: We have a book club at work and this was the July choice! I have read one other Neil Gaiman book in my life (The Graveyard Book which I loved), and I think it is important for me to start there. The problem with Gaiman is that is he super awesome and famous (a rough problem to have I guess) but it gives these high expectations to his books. I really liked The Graveyard Book and I've checked out Stardust for a car ride later today, but I just could not connect with The Ocean at the End of the Lane. My favorite quote from book club was that this book at the same time felt too long yet underdeveloped. There were times I wanted to know more (everything with the Hempstock family) and times where I just didn't think anything was happening. It has this strange story like feel to it where you kind of expect something to be left up to the imagination, but I think the wrong parts were. There were times in this story where I was quite freaked out (the nanny) and other times where I was enchanted (the kitty). But overall it has the feel of a short story stretched out into a novel, though it still only clocks in at a hundred fifty pages and some change. Questions for Gaiman readers out there, what would you recommend be the first book in his back list for new readers to try? I'd say the Graveyard Book (since it is the one out of two that I've read and liked). If you loved 'The Graveyard Book' you will adore 'Coraline'. Gaiman is so excellent at writing for children. I started my Gaiman-reading with 'Stardust', which I thought was a simple and lovely fairy-tale. I do not think, one should start with 'The Ocean at the End of the Lane' either. 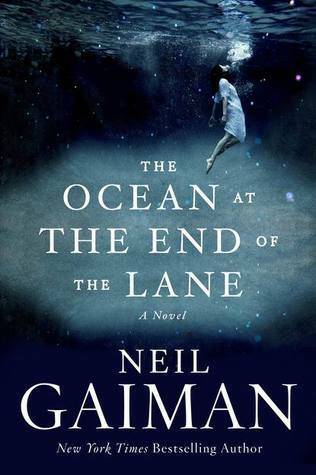 Not because it isn't good (it is my favorite book of his and I adore it), but simply because it is a very intimate story, that makes more sense if you know Gaiman's writing better. In fact, he himself has said that it is the closets thing to a autobiography he will ever write; an unreliable retelling of his own childhood. That said, I obviously loved the book. For me it was a sincere tale of childhood traumas and uncertain memories; a deep examination of how we forget and remember, and how we become who we are. It was a very personal and beautiful read for me. Honestly, though, I think Gaiman kind of has a range of titles that have the potential to appeal to a number of different kinds of readers, so I don't think there's one best book to start with necessarily - I think it's kind of dependent on the individual reader. CORALINE is really dark and charming and appeals to kids as well as adults. NEVERWHERE is pretty straight up urban fantasy. STARDUST is basically a fairy tale. GOOD OMENS (co written with Terry Pratchett) is my husband's favorite and is a more humorous read than most of Gaiman's work. ANANSI BOYS is the only one I don't recommend starting with - it's connected to AMERICAN GODS (which I've not yet read) and though it can be read alone, I think fans of AG can appreciate it more. Honestly, though, I think Gaiman kind of has a range of titles that have the potential to appeal to a number of different kinds of readers, so I don't think there's one best book to start with necessarily. I really agree with this. I had a coworker who on our work book club forum ask which Gaiman she should read next if she didnt really like Ocean, and she got SO MANY answers. I am listening to Stardust now and I think she may like that based on what I know of her reading preferences. I've heard a lot of good things about American Gods. American Gods is really good, but it is pretty big and dense, so I think it helped me personally to have read some of his other books first. Since I haven't read a Gaiman book yet, I think I'll start with the Graveyard Book (as you did) or Stardust and then read this one if I like those. Thanks for the heads up! I am actually listening to Stardust on audiobook now and its narrated by Gaiman. He is excellent at narrating it and I know that he is pronouncing the words and characters right (since he wrote it lol). I am only like almost halfway through (I had a 4hr road trip... with the ride back home tomorrow), so I can't say if it is great or not.. and I have already seen the movie (though it was years ago) so I can't give my thumbs up down or sideways yet. But Graveyard Book hit home with me! I'd also recommend starting with The Graveyard Book. I enjoy his books for children/teens a lot more than his adult novels. And I think they're better as audiobooks; he's a great narrator. I'm reading this right now (as a huge Gaiman fan). I'd say The Graveyard Book is an excellent first time read. And then maybe Coraline or Stardust. I hope you like it! I think Gaiman fans may connect with it more... but there are people on here (and IRL) that I have talked to that said it was their first Gaiman and they loved it so *shrug* I claim to predict nothing. I recently read this as my second Neil Gaiman (also after The Graveyard Book! ), and although there were some great elements, I didn't connect with it either. I wanted to know more too! I love Neil's work and I actually ended up loving this one. But he tends to give a barer narrative with his adult titles, which I love, but know isn't everyone's cup of tea. I would say Coraline and Neverwhere are my personal two favorites! Yeah, and I get the barer narrative thing, it's just the places I thought were bare needed more and the places that had a lot, I thought needed less. I loved this...and it was my first Gaiman. The Graveyard Book was also my first Gaiman book, but I think people should definitely start with Neverwhere. It's for an older age group than The Graveyard Book, and it's very clever. The characters also come off as more developed and the mythology is really interesting. Plus, there is an amazing BBC4 radio show made from the book that was incredible. I haven't read Ocean at the End of the Lane yet, but I look forward to it. Funny thing about Gaiman is that I don't feel like any of this books are similar to each other so it's fun to always get something a little different. I don't understand english very well but I'm practicing with you revviewr. Sorry for my mistakes. I haven't read any books by this author and if I read something I thing I should read The Graveyard Book if I see this book in spanish. I tried to read The Graveyard Book a few years back, but couldn't get through it. I've had Stardust sitting on my shelf for ages, picked up at the used bookstore, but I've never even cracked the book open. Really like the cover to this book, nice image. On my wish list.